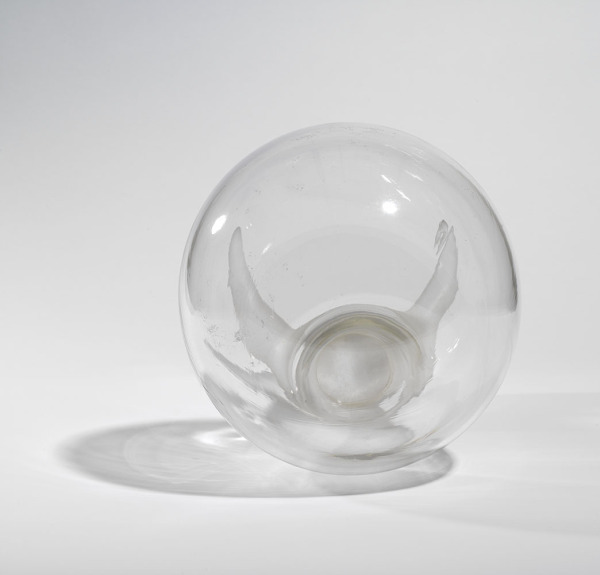 Clear glass bubble extending into horn shaped form in frosted glass. Free blown bent clear glass bubble. Ground on flat bed grinding machine by hand. 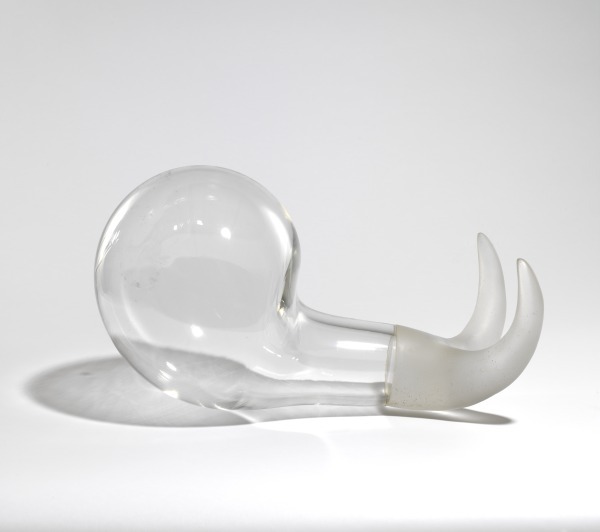 The "claw" was originally modelled in wax straight onto the bubble. The wax was then invested? and steamed from the mould before being cast in the kiln using lead crystal cullet. The cast glass 'claw' was smoothed using diamond abrasive wheel and by hand. The two elements were carefully ground to fit and then glued using ultra violet reacting glue. Swollen, Emma Woffenden, 1996, Crafts Council Collection: G84. Photo: Todd-White Art Photography. 1997: "I have gravitated more and more towards a crafted sculpture, exploiting fully all my technical glass knowledge and fascination for the material. Using material and technique as form and metaphor, Swollen uses an inflated bubble stretched and pregnant looking. The smooth transparent form with no details, a simple bent bubble can be a first step in making a glass form and has come to represent the embryonic. The gesture of Swollen links to Retortion 1993, Apparatus 1993 and the Buds current work. The claw form is both vulnerable (an open receptive gesture) and aggressive. Hooks, claws and hand gestures can be seen in Arc, Alert and Grip (from 1993), Baby Chain and Baby Arm (1996). For me Swollen appears to be giving birth and being born at the same time. Establishing Transglass (1997), clearly a product based enterprise and a collaborative one has freed the sculpture. Any need to link to function or the vessel has gone.